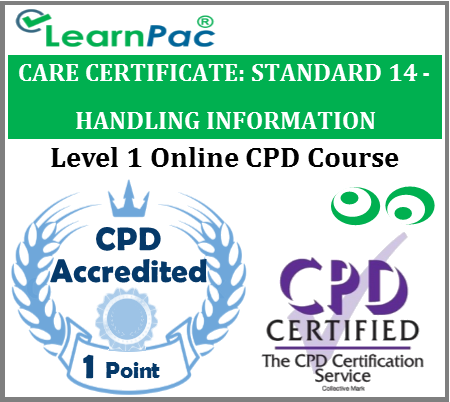 Welcome to our online care certificate standard 14 handling information training course for healthcare and social care providers. Our online care certificate standard 14 handling information training course was developed in line with the latest UK legislation and meet the requirements set out in the Care Certificate, the the National Health Service (NHS), Skills for Health’s UK Core Skills Training Framework (CSTF), the Care Quality Commission (CQC), Skills for Care, UK Health and Safety Executive (HSE) and other professional and regulatory bodies. What is covered in this online care certificate standard 14 training course? Who is the online care certificate standard 14 training course for? Our online care certificate standard 14 training courses should be completed by all healthcare and social care staff. This includes voluntary staff and unpaid working in NHS and private hospitals. Locum doctors, locum allied health professionals, agency nurses and healthcare assistants can also complete these e learning courses. These care certificate standard 14 training courses are also relevant for health and social care support workers, including those who work for nursing care homes, residential care homes and charities. At the end of this care certificate standard 14 role e-learning course, learners will be required to complete an online assessment. On successful completion of the knowledge test (80% pass mark), learners will be able to download a FREE CPD certificate that is valid for one year. 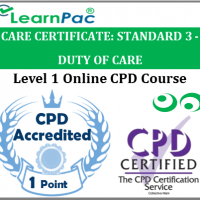 The content of this online care certificate standard 14 training course has been independently certified as conforming to universally accepted Continuous Professional Development (CPD) guidelines. After adding your care certificate standard 14 e learning course (s) to the shopping cart (by selecting Add to Cart), you will be able to make a secure payment using all major credit and debit cards. What is the care certificate standard 14 – handling information? The care certificate standard 14 module covers issues relating to the handling of personal and sensitive information in health and social care sectors. The information about an individual’s care and support may be personal and sensitive. This information must be treated as confidential and only shared with people who need to know. An important part of building trust. Why is this care certificate standard 14 handling information course important? The Data Protection Act 1984 introduced rules on the storage and use of information. The Act was revised in 2003 to include paper-based filing systems data. Should not be transferred to other countries where there is no adequate protection in place. It is essential for all health and social care workers to know their responsibilities relating to handling information in line with the Data Protection Act 1984. This online care certificate standard 14 handling information training course was developed in line with the CSTF learning outcomes. I really liked the activities in the course, will defo purchase more care certificate modules ! Good quality online course – will be purchasing more for my staff!